Charlie Ross presents from The Royal Welsh Showground in Builth Wells. Philip Serrell and Thomas Plant are guiding the reds and blues. Browse content similar to Builth 8. Check below for episodes and series from the same categories and more! where these medieval paintings were uncovered after 500 years. And here we have depicted some of the Seven Deadly Sins. Like lust, gluttony and greed. fall victim to any of those today. I'll be coming back here later on. But in the meantime, let's go Bargain Hunting! where, over the years, it's been given the Royal stamp of approval. They came to see prize-winning animals. But today, it's antiques that are on show. to take off to auction, and hopefully make a profit. Let's check out what's coming up. You've got to buy one thing in the next nine minutes. And it's got to be a good thing. The Blues flex their muscles. Careful. It's got a good weight, hasn't it? Yes, it's heavier than I thought it would be. Yes, come on, come on! ..while the Reds smell victory. 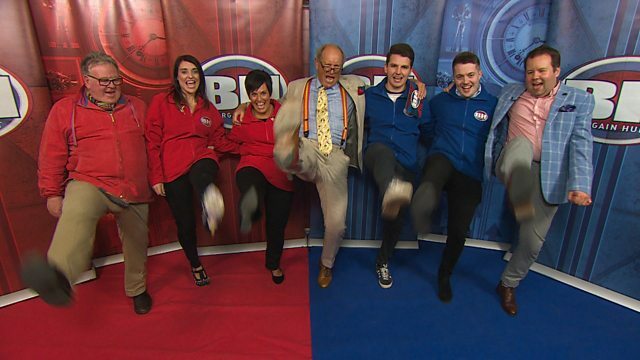 This is one of the great Bargain Hunt moments. But that's all for later. Now, let's meet today's teams. and for the Blues we have stepbrothers Nathan and Ryan. Oh, lovely to see you here. My word, what a tan! -Where did you get that - Costa Rica? Did one of you go without the other? Yeah, she didn't take me. That doesn't sound very fair, does it? -We are from Carmarthen in West Wales. Now, Christie, what about work? What do you do for a living? Well, we're both careers advisers. -We're both based in school. Is it difficult to fire up young people with enthusiasm? On the whole, they're very good and they want to succeed, so, yeah. So, when you are not working, what do you like doing? We both really enjoy running. -Yes, we do a lot of running in our spare time. Angharad, do you really enjoy this running lark? -We only started last year. Yeah, we took part in a TV programme. trained us from couch to running the half marathon in 12 weeks. -Erm... Limited knowledge, I would say. And I've collected sort of antique plates and things like that. What about tactics? Are you going to agree? -No, is the simple answer to that, I think! Maybe. We're going to have our own little competition going on. Obviously we're going to beat the Blues. Steady, boys! Well, all the best. Good luck with it. -I'm sure you'll get on really well. Don't fall out while you're shopping. -Now we have stepbrothers Nathan and Ryan. So where do you come from, Nathan? I come from Porth which a small town within the Rhondda Valleys. but I recently moved out. Yeah. Good rugby-playing area, isn't it? Definitely, yes. Yeah, produced a lot of Welsh internationals. -Now, boxing - you're both keen on boxing, aren't you? -We are massive fans of boxing. We got into it about ten years ago. We've gone to lots of UK events and even worldwide events. Is it expensive to go to a boxing fight? Vegas? Oh, my goodness, that's a long way to go. It can be very expensive, very, very expensive. and there's a knockout in the first minute? -Don't you feel a bit cheated? -Well, luckily that hasn't happened yet. Now, what about antiques? You collect things, don't you? Yeah, so I collect pub memorabilia. -Yeah, ranging from mirrors to beer mats. -Fantastic. And what about you, Nathan? or are we going to be looking at other things? spend a bit more money and see what we can find. Well, have a great time, enjoy it. What are you going to need, teams? "May I?!" Well, I've got £300 for each of you. -There we go. 300 for you. -Good luck. Have a great shop with your experts. But who will deliver the knockout blow? Boxers come with an entourage. Our teams come with an expert. He'll be the Reds' best friend - it's Phil Serrell. And stepping up for the Blues, it's Thomas Plant. Ryan, what are we looking for? -and also some sporting goods, if we can get it. I like things that are quite unusual, pretty. -Something to do with the dogs would be quite nice. Your 60 minutes start now. I'd like to spend all of our money. -No, no, I'm going to save it. -Right. Bit of conflict here, then! Sport, pubs and dogs. Well, let's go! while our Blues brothers are in perfect harmony. And they've spotted something sporty straightaway. -Yeah, what sort of age are we looking at there? Let's have a look. It might have a date on it. No, it doesn't. It's quite heavy. Wow, there's a weight on that. I reckon that's what, maybe 15, 20 kilos? -Have a feel of that, mate. -Careful. It's a good weight, isn't it? It's heavier than I thought it would be. played on the lakes, on the lochs. giving the sport its nickname - the roaring game. It's a fabulous thing, great sport. Well, I think it's £95, which is rather a lot of money. -I like it as well. -That's a possible, I think. Shall we find out how...? I think we could send Nathan in, if you're happy, Nath? Yeah, go on, yeah. Would you be happy paying £70 perhaps for that? -Yeah, would you be happy...? Start there and see where it goes. -Do I have to take it with me? the Reds are talking about having a lie down. And what you do, you undo the top and there's matches in there. as you go to bed and it's called a go-to-bed. they should enjoy this bout of haggling with the dealer. -We're thinking more around the 50 mark. 75 and we've got a deal. -No, I think we've got to go a bit more. -There's little profits in these things. And that, we know, is better than it was going to be so well done, you. Well done, you! Happy with that, Ryan? First item down, let's go and find the next one. and gets a £30 discount on the curling stone. although Phil might have found you a potential purchase. -How old do you think these are? No great age. -Not a lot of age, no. Ten or 20 years old? that would have been made 150, 160 years ago. in those days as they are today. which if they got too close to the fire, their faces melted. -So these screens kept the heat off them. Today, a pair of these might be worth 200-400. -Now, these have got no age to them so they're going to be less. a little bit different. Not what I expected to buy. Same. I think they look nice. They're quite appealing. I think a lot of people would like them. So what do you think you should be paying for these? -I've got 100 quid on them, right? We're selling them for a good friend. He said, just sell them. For you, 50 quid today, that's it. -It'll save me taking them home, see. I think they're going to make between £40 and £80 at auction. -At £50, he's being more than fair to you. -You've been very kind to us, thank you. Thank you. You both like them. Look at that. It's a unanimous agreement on a pair of screens for £50. so how are we going to carve up the rest of it? Are you going to buy one lot each or are we going to agree? -I think we're going to go for one each now. What's yours going to be? Something like a little jewellery box or something like that I think. -A little jewellery box. What about you? and it looks like the boys have found a contender for item two. -I don't mind it, yeah. were the first people to make the chocolate bar. 50 years before Cadbury's released their first chocolate bar. -It's from 1910. I like it. -You're sold on it, aren't you? -Not for me, but if you really, really want it. -If you're really into it. And Thomas was so keen! Back to the Reds, and Phil is excited as well. Right... That is the equivalent of antique blotting paper. you then sprinkled this all over the paper and it dried off the ink. this would unscrew some way or other, I hope. and you'd pour the pounce that you haven't used, back in there. -..and out of our budget! That would leave you £10 for two items and a bonus buy. I suggest you find something else, Reds. Pens? Writing instruments, are you into writing? -Always popular. No, you're not into writing? No, we're not into writing. Well, Thomas, that brought another one of your ideas to a full stop. to write home about with these antique card cases? It's silver wire work, really, isn't it? -And where would they have come from? but also made a lot in the Mediterranean area. Which do you prefer? Angharad, which one do you like best? but I think that's because that's more of a blokey one. whereas that's much more Continental in style. There's no way Nick's going to half-price those. The Reds certainly have expensive tastes. could this little number keep the Blues on track? -Reminds me of my first car! This reminds you of your first car? -What do you like about this? -I don't know. It's just quite quirky. -It's a bit out there, but it does catch my eye as well. Are you sure you want to go for something like this? Yes. I'm not keeping it. What would, kind of, the resale on that be? I think resale auction value, about 20 quid. -Might be a little bit more. -..if you've really fallen in love with it. -Yeah, we will leave that one, then. -I did like it but not for £90. So, it's a no to the toy car. Now it's back to the Reds, who also seem to have stalled. so you've got to buy one thing in the next nine minutes, OK? -I'm going to time you. And it's got to be a good thing! the Blues are staying cool. -Oh, that's rather fun, isn't it? Looks like a sailor's Valentine. of the sailor, to remember them when they're away at sea. because we have the ensign for the Merchant Navy there. "God is on my right," which is great, it says on there. -And what do you think that would do at auction? getting much off this, less than sort of maybe 50 quid. But I can go and ask. I think it's worth having a go at. -You can ask, definitely ask. If you could ask nicely for us, yeah, thank you. Fingers crossed, Thomas can charm the dealer. -Picked the right price there, hasn't he? -Yeah, he won't go as low as 50. I've tried. 55, it is a risk. I have just seen something, though. Do you want to think about this or do you want to sort of...? Yeah, if we could have a look at the item? I'm interested in what you found over there. Yeah, I did, which you might like. -So we're going to put that down. -You seem intrigued by it. Stay there. I'll bring it to you. the Reds are hoping for a eureka moment of their own. I'm sure there must be something here for us. -Nothing in the price range, I don't think. Don't panic! You've still got £250 to play with. -So, this is a tobacco jar. There's the monkey with his pipe. One up from Darwin, we are. -This is the joke this is giving us. This was made in the late 19th century. -A bit of humour with it. -A bit of humour to it. In good condition as well, isn't it? -The best thing about it is the price. -Yeah, we definitely like it. We were looking for something in that area as well. -Do you want to forget about that? -Yeah, I think we like this one better. All right. Shall I try and get it for 20? -Or anything off that from there? I think there is profit in that all day long. Mr Plant is working hard for you today, boys. 20 quid. Thank you very much. -Thomas is happy. He's shaken hands. I've done it. I thought, 20 quid. -Yeah, we're very happy with that. with two items to find and just over 20 minutes left on the clock. -I quite like the little snuffbox there. -I like both of those. -That one and that one? -We don't want that, then. The lady might do you a deal, you never know, do you? -What's the best you could do that for, my dear? -Looks to me like it's 20 quid's worth, really. OK. We'll pass on. Thank you very much indeed. What did the dealer say? £40? That's disappointing. So, are the Blues having any better luck? This has really caught my attention. -All the scuffs, have they been done? -Interesting item, though, wasn't it? Look, staring out at you like demonic eyes. Looks like it's got two different eyes. They really look really scary. How much are your pugs, please? Yeah, damaged, it's a shame, but they're quite cool. -Yeah, I do like them. -Nathan loves a pug as well. And I thought Nathan had found his doggy item there. Meanwhile, can Phil woo the ladies with some silver? Do you like that? That is a little Victorian silver dressing table box. -It's got a Birmingham hallmark on it. It's priced at £75. The lady says you can have it for £45. I like the flowers on the top, the little engraved flowers. Is that a name on the top there? -It's quite cute. I like it. I think it's more you. Oh, come on, tell me, then, Angharad, why is that you? Well, it's silver, so it's what I was looking for and it's pretty. So 45, it's reduced from £75 to 45. We're up against it, time-wise. -You go and look that way, I'll go and buy. Phew, that's buy number two in the bag with just over 15 minutes left. Right, we've got to hurry up now. -Come on. Come on, come on, go, go, go. while the boys haven't even broken sweat. There you are, you see? There is your sporting item. -You've got the painted scoreboard on there. vintage snooker/billiard scoreboard - £35. What do you genuinely think, Ryan? the snooker club, have a game of snooker with your family. -Yeah, I really like it. -I think it's safe for our last option. 35, you've only spent £85. This is hardly going to break the bank. -It goes in with your theme, doesn't it? Ryan, do you... Who wants to go and have a chat? Or shall I? -I think it's Ryan's turn. -This is all down to you, isn't it? Gentleman's waiting to speak to you. Hello. Are you coming in to chat to us? -Yes, we like your scoreboard there. -What sort of price would you be looking at? It's 35 on the ticket. -Yeah, we're looking closer to 20, really. -I think that's quite a good compromise. -Yeah, we'll be happy with that. -There he is, he's done it. Get in. I can't believe that. -25 quid, I think that's a brilliant buy. -I think that's absolutely fabulous, well done. That's our third and final item. A real pleasure. Thank you very much. What a couple of champion shoppers, taking it all in their stride. -I think it's time for a cup of tea, don't you? I thought a sports bar would be more their thing! although they've only got ten minutes until last orders. Come on, then, ladies, what have you got? What have you got? What HAVE you got? -It's a cocktail shaker and it's a penguin. -But would it make us any money? There are actually three different types of cocktail shaker. -So what's your favourite cocktail? -Well, I like espresso martinis. -What are you going to get it for? -20. We've got to buy it, haven't we? give him 20 quid and think of a Bargain Hunt cocktail. But hurry up, Reds, because you have just minutes left to do a deal. -Well, have you bought it? -Top job! We're finished. Three things bought. Home and hosed. Right, teams, your time is up. One last question, what is the Bargain Hunt cocktail? We're not sure yet but we hope it's not going to be Red on the Rocks. Very good, I like that. Come on, let's go. That's been absolutely fantastic. -That's the best way to spend an hour, isn't it? Now let's just remind ourselves what the Red team have bought. Christie and Angharad got £100 off this pair of replica pole screens. The silver dressing table box was £45. -a pleasant change, to be outside? -Not really. It's a bit cold. -Cold, you'd rather be back inside shopping. For me, personally, the penguin, the penguin cocktail shaker. -Will it make the biggest profit, though? No, I think the fire screens will. You think the fire screens. They're rather nice. -But your favourite lot is the little box. -You like that little box. -What did it cost, 45? -Yeah. Quite a good buy. -Are you going to get a golden gavel? Should I have mentioned that? Now, you spent £115, so you've got £185 left over. -How are you possibly going to improve on this? Charlie, I'm going to go and find something to put the penguin in. I'm going to check out just what the Blue team have bought. in under five minutes, for £65. Well, Nathan and Ryan, you kept with that sporting theme. we're quite happy with that, really. -It's got to be the tobacco jar. -I really like the tobacco jar. -I like the curling stone. Do you think that will make the biggest profit, though? I think it could be a dark horse, it could go really well. Thomas Plant with £190, anything could happen. What are you going to do with that, Thomas? and I'm going to make sure that void is filled. and to that little church, to check out the medieval murals. ..a unique collection of medieval paintings. And seeing this for the first time is truly moving. a Christian crusader who saved a princess from a dragon. to the Seven Deadly Sins. In every case, they're being egged on by the devil. was brought in to uncover them. You couldn't see anything of the paintings. They were completely covered over, with over 20 layers of lime wash.
you'll get a flavour of what these walls all looked like. We worked down through those layers, one layer at a time. -One layer at a time? -Using what as an instrument? as she patiently removes the lime wash to reveal the secrets beneath. a square inch an hour was fast. It gives you an idea of the scale that we're working on. and what they've uncovered during that time has caused quite a stir. How important are all these paintings? They are exceptional. They are internationally important. in the UK this century. What an accolade for the artist who painted them. This painter was something else. -We don't know who he was. -No, and of course there is no signature. Would he have been a professional painter? and he's looked at how he can fill it. an honourable man who spent his life spreading the word of Christianity. But the sins were a warning about living life on the wild side. I think I've ever seen in this country. the electrical charge between those two beasts is second to none. in any other example illustration I've ever seen. He's a complete master of theatre. included in the combat scene. so that makes Llancarfan absolutely unique in this imagery. How many more years' work do you think you have? to work on such an important discovery? of unlocking the mystery of these paintings. at the saleroom of Rogers, Jones & Co in Cardiff. And as luck would have it, I'm with the auctioneer and boss, Ben. -Hello. Croeso cynnes i Cymru. Which must mean, "Hello, Charlie, have a nice day." Not quite. A warm welcome to Wales, Charlie. A warm welcome to Wales. Well, thank you very much indeed. they bought a pair of pole screens. -Made yesterday, probably, but rather nice. I think they've got a bit of class about them. -They are pretty good, aren't they? What about a value? Well, that's good, they paid £50. I think we're in the black on those. Well, that's good. Second item is a little bit of silver. Perfectly acceptable Victorian silver box. I think it's rather nice. Mab's for Mabel, I suppose. -What about a value on that? Perhaps a little bit on the rich side. If Mab steps into the saleroom, we are in luck, aren't we? Now, this is quite fun, isn't it? This is the third item, Christie really liked this cocktail shaker. -I think it's great fun. -And cocktails, they're all the rage at the moment, aren't they? -They are, or so they say. It's a fun, fun thing. What about a value? It hasn't really got any great age, has it? No, it's not got age, but does that matter too much? -It's just a novelty item. Yeah. What about a value? They are looking pretty good, aren't they? but in case they do, let's have a look at it. you are probably a little nervous, aren't you? He's gone off to find something in which to put your penguin. Shall we have a look at Philip's penguin home? I think that's a lovely bit of burr walnut, 19th century. -And you said how much? -That's quite interesting, isn't it? -Yeah, because it cost me 50 quid. You really, really like it. -I really like it. I like the walnut. It's ticking my boxes. I don't think Angharad will be impressed. I'm sure she's not, I just saw the face. Angharad, you're grimacing a little bit. Yeah, I can't see the use for it. -Charlie, I'll see you later on. Come back, Philip. Well, you don't have to make up your mind now. Meanwhile, let's see what the auctioneer thinks. and I think it's a decanter box. It's neat, it's got a nice outer case, which is in good condition. Lacking a little bit of character, I think. £40-60, paid £50, so smack in the middle of your estimate. -So moving on to the Blue team, Nathan and Ryan. by buying a curling stone. It's OK, I mean, these are quite popular now. -With doorstops and that sort of thing. and a couple of chips around the edge. Yeah. What about a value? Difficult thing to value, isn't it? £40-60, we've put on that one. Could be on thin ice! Let's move on to the Doulton Lambeth tobacco jar. It's in cracking condition, isn't it? for Doulton Lambeth. A good fun thing. -30-40. Well, only paid £20. Now, let's move on to the scoreboard. I think this has got a problem. -It's just a bit ordinary, really. -I think they are going to struggle with this one. but they might need a bonus buy. Nathan and Ryan gave Thomas Plant £190. So what do you think he's done with it? Has he bought Phil Serrell? Oh, come on, boys, what does it look like? -Well, Nathan, what do you think of it? I think it has a lot of charm. -I would certainly have it in my house. -Yeah, I definitely would. I think it should do well. Good. Ryan, you're the expert on pub memorabilia. -How does this fit in your...? I'm actually looking for one of these as well. -Yeah, it's definitely is something I like. But unfortunately there is one big hole in this. -Oh, the bottom has fallen out. You're not going to need it, to have it as a table. -What sort of age is it? -About 1920s, I would say, 1930s. Yeah, it looks it, too. What about having a stab at the value of it? Yeah, probably round about 50 marker, 40-50. -Well, Thomas, what did you pay for it? Anyway, chaps, you don't have to make up your mind now. Not in the best condition. Ooh. Isn't that a trifle mean? -You don't like it, do you? Um, well, it's a bottomless barrel! What are you going to do with a bottomless barrel? I tell you why, it's because Thomas paid £50 for it. -Is it full of beer? -it might make nearer the mark. Ben, you will be doing a cracking job on the rostrum as always. getting huge money for this bottomless barrel. I'll try and earn my beer. but it will be an interesting sale. 300. Five at the door. you two girls or the old boy in the corner there. We kick off with the pole screens, which I think are super. They're not old, but they are in fabulous condition. The needlework is good, they cost £50, and here they are. I have to start at £80. I had to start there, with the bids on the book. 90 and I am out. Let's say ten. 110, 120. Do you know, they are making more money than old ones would make. 150, the hammer is up. Here comes the little dressing table box. -Five your bid. 25 now. 30 bid, is there 35? 40 bid. Is there five? 45 in the room, against you. Out online. 50, new bidder. Is everybody done? Hammer is up at 70. I think we're out in Cardiff tonight, Charlie. I love it. The auctioneer loves it. And it only cost £20, didn't it? Is there five? At 40. Is there five? At 45 and I am out. Before you, online, 45's in the room. 65, if you like, sir. Online, the bid, is everybody done? Do you know how much profit you have made? Hang on, girls, you have got to concentrate on his box now. He paid 50, you think it's worth 40. -You think it's worth 60. You are definitely not going with it. -Do you want to know the auctioneer's estimate? 50 I have. At 50 online. Is there 60? At 55, 60 bid. 70 if you like. £60. Is there 70? At 60, at 60. Nice box here at £60. Five, 65 in the room. 70. At 70 in the US. 75 in the UK, here in the saleroom. In the saleroom, then, at 75. Everybody done? Hammer is up at 75. You have still made £165. because you will probably make them cry. You started off with the curling stone and it cost £65. I have to start at £28. Is there 30? £28, 30, anyone? Hold on to your hats, we are straight in at £60. 60, 70 in the room. Is there 80 now? 80 now, 90, if you like. £80, £80, online, the bid. Have we all done? All done then at 80? I think that made more money than it would have done in Scotland. Here comes your tobacco pot. -Yes, I think there's profit there. The auctioneer really likes this. Thinks it will make a profit. I have got a lowly bid. I don't want to start there. Thank you. £10, better than my bid, £10 is in the room. At £10. A disappointing bid. At £10. Is there 15? At £10. 12, if you like. At ten, at ten, 12. One more? £12. 15, anybody? Everybody done. Hammer is up at 12. The snooker board. Well, it only cost £25. And here it comes. -It has got to be a fiver, if we're going. At five now. At five. It's a blue ball at five, isn't it? At five. Is everybody done at five? Last call at five. Hammer's up. which meant you were plus seven. You then lost 20, which makes you -£13. -It's not bad, is it? -£13. And you've got a beer barrel to go. The beer barrel is the way forward. -Yes, definitely going to go with it. Do you want to know the auctioneer's estimate or not? No. that the auctioneer's estimate is 10-20. £40. At £40, is there five? It must be full of beer. At £40. Where is the five now? Have we all done? At 40. Five. Everybody done then at 50? So you are down £13 only. Anyway, chaps, not a word to the Reds. and in some cases losses. Sometimes, both teams make a profit. Sometimes, both teams make a loss. and the other team has made a thumping great profit. And the winners are, without a doubt, the Red team! Anyway, boys, you didn't do badly. I mean, it was just that snooker board. -It was Thomas's idea to buy that! -But you have had fun, haven't you? Reds, that was just amazing. The pole screens cost £50. -How much did they make? -Your dressing table box cost £45, made 70. Your cocktail shaker, which Philip loved so much, £60. Are you thinking of taking up antique dealing? -I think we'd be very good at it. I think you would be absolutely brilliant at it. -You may touch it, and you can keep it. compared with what is going to happen next. I have TWO golden gavels. Well done, girls. We have all had fun, haven't we? And not everybody can win. have a look at our website and indeed to follow us on Twitter. In the meantime, join us for more Bargain Hunting. Charlie Ross presents from The Royal Welsh Showground in Builth Wells. Philip Serrell and Thomas Plant are guiding the reds and blues, who have £300 to spend on three items that will hopefully make them a profit at the auction in Cardiff. Charlie also learns more about a unique collection of medieval church paintings that were discovered after hundreds of years.